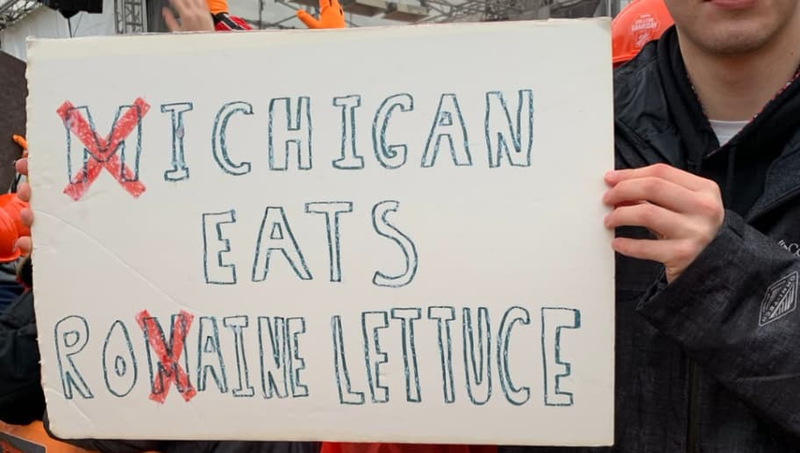 ​We've got College Gameday in Columbus for ​THE Game, a classic Ohio State-Michigan matchup featuring two top-ten teams fighting for a spot in the playoff. What's more entertaining than the on-field product? The gameday signs of course. Here are the best of the best from ​THE Ohio State University. You shouldn't eat that! There was a national recall! Do the Scarn, that'll show him. Cue the X's. Nobody likes the letter M anyway. Lee Corso picking the home team? Color us shocked. Yeah but LeBron only won 3...I guess we get the joke. Bama found out the hard way...nobody wants The Citadel. Michigan's revenge tour has one last stop, and it's a big one. Do I have an answer to this one? No. But thank you for asking, we haven't seen this guy in years. Is this worse than Patrick Mahomes putting ketchup on everything? Wolverine tears don't give you special powers, I don't think. Sorry, Brutus. Tiger had one putt to win $9 million and botched it, but his major victories say otherwise. Harbaugh's won...what exactly? We can't wait for kickoff.